Sun Valley Ski Education Foundation hosted the U16 Western Region Championship March 14th – 17th. 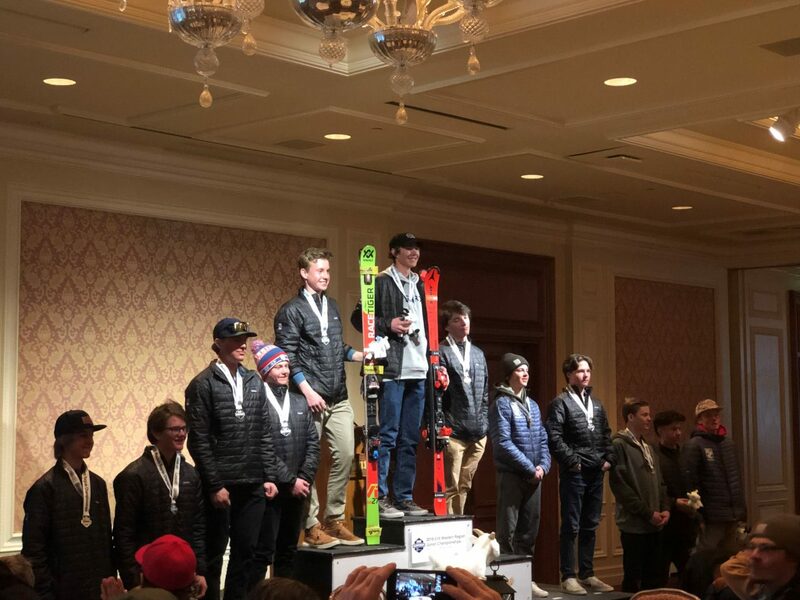 Under the direction of head coach Joe Dunn, twenty-one Park City Ski and Snowboard alpine athletes traveled to the four-day race series. At the event, PCSS racers helped represent the Intermountain region (Utah, southern Idaho & western Wyoming). Racers competed in three disciplines against athletes from Alaska, Far West (California & Nevada), Northern (Montana, northern Wyoming and western South Dakota), and Pacific Northwest (Washington, Oregon and northern Idaho). Thursday was a USSA-scored super G race which was separate from the Western Region Championship, held under bluebird skies. Erica Lynch from Mammoth proved to be the master of the speed discipline, winning first with a time of 1 minute 4.18 seconds to lead the girls category. PCSS’s Kennedy Heavrin was also blisteringly fast, and just off the podium in sixth out of a field of 83 competitors. Mia Hunt of PCSS also put down an impressive run, earning 14th. The boys race followed at 1 p.m. when Justin Bigatel of PCSS Continued his season dominance, capturing first place among a field of 87 racers with a time of 1:02.28. PCSS athletes Gunnar Travis, Tay Polster and Jack Pollard also showed their prowess, taking fourth, seventh and eighth respectively. Friday started under more epic weather with the girls super G championship race. Erika Lynch of Mammoth set the pace for the second day in a row with a winning time of 53:08. Two PCSS female racers proved that they can ski at their limit from the top to the bottom of the course. Kennedy Heavrin earned sixth with a time of 54:16 and Mia Hunt eighth with a time of 54.76. The boys championship giant slalom race was held on Greyhawk run. Ryder Sarchett of Sun Valley won both the first and second runs to win the race with a combined time of 1:40.21. It was a stellar day for PCSS male racers: Justin Bigatel took second, Gunnar Travis took third, and Benny Brown and Dylan Thompson tied for fifth. Also finishing in the top 15 were T.J. Weaver in ninth and Tay Polster in 11th. Saturday morning started with the boys championship super G race. PCSS earned the top two podium spots with Justin Bigatel in first and Gunnar Travis in second. Benny Brown was just off the podium in sixth, followed by T.J. Weaver in eighth and Tay Polster 10th. The girls put together two separate runs to determine who would be crowned Mrs. GS. Dasha Romanov of Sun Valley won the GS title with a combined time of 1:48.07. PCSS’s Mia Hunt earned a fifth-place podium spot with a time of 1:50.01. Kennedy Heavrin also proved she has the goods with a ninth-place finish. On St. Patrick’s Day Sunday, both girls and boys competed to see who would be crowned the slalom champ. The boys started racing at 9 a.m. sharp. Nearly 40 racers did not have the luck of the Irish and either failed to finish a run or were disqualified. Ryder Sarchett won the technical two-run test and earned the top podium spot. Gunnar Travis and Jack Pollard won medals with third and seventh place finishes. Dylan Thompson put together two solid runs to capture 11th. For the girls, Tea Kiesel of SBSTA showed strong tactical skiing to earn first place. PCSS had two girls in the top 15: Mia Hunt in seventh and Annika Drivdahl in 14th.